Sewer lines and piping lie mostly beneath the ground, and when something’s out of sight, it’s out of mind. Water and sewer lines can often be neglected or ignored for years, that is, until water begins backing up and leaking into the home. If you’re thinking about purchasing an older home, a sewer line inspection is one of the most important inspections to have before closing. Cornerstone offers sewer camera inspections as an additional service whether or not you need a full home inspection. Depending on the closing contract, the seller may be responsible for repairing any clogged or damaged sewer lines. Failing sewer lines are common, and a sewer cam inspection is the best way to catch any clogs or blockages. When should you consider a sewer cam inspection? Always, if the home is 20 years or older. If the home is new, find out whether the sewer lines and piping are new as well. Sometimes a brand new or newly-renovated home is build atop old sewer lines. This is especially important in older communities where pipes can be 50+ years old, more so than new subdivisions. If you are selling a home, you should consider getting a sewer inspection. You could be liable for fixing the piping if the buyer finds problems before you do. Also, pipes that are new or in good condition are a desirable selling point in a hot market. When do sewer lines fail? One of the most common reasons is tree root intrusion. Tree roots grow larger over time, and the wood can expand or shrink depending on how much moisture is present in the soil. 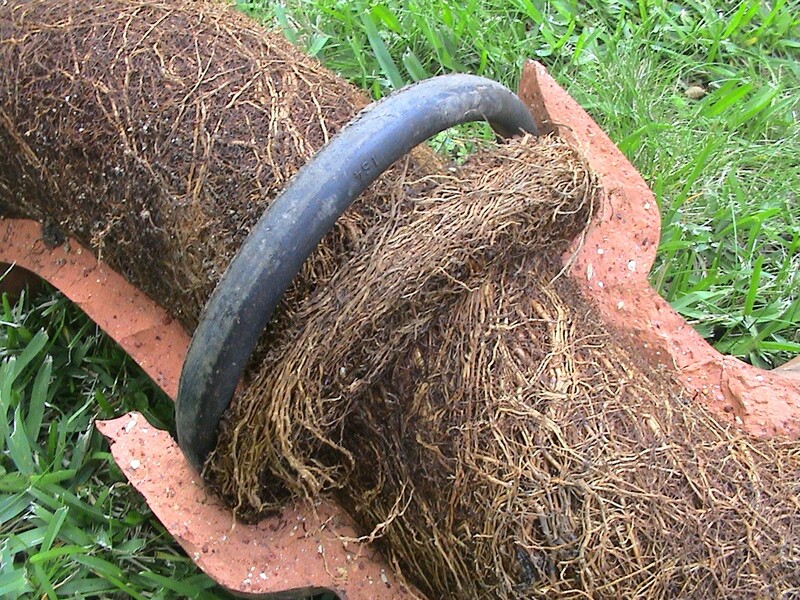 Roots grow towards water, so if there is a crack in the sewer lines, roots can grow into the piping almost immediately. 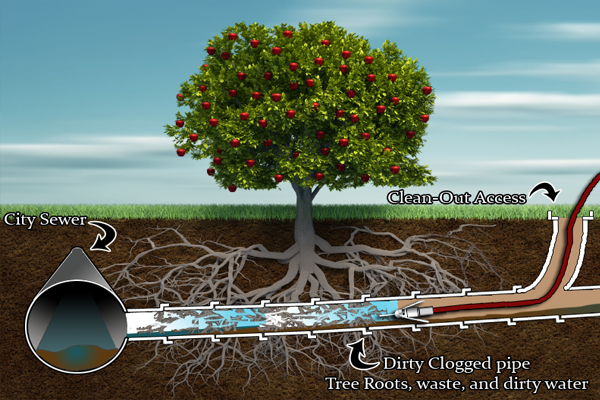 Tree roots cause things like hair and grease to build up and clog pipes, which could cause water to back up and come out at the sump pump or elsewhere. Also, natural ground movement can impact sewer lines as well, particularly in areas where earthquakes are common. Luckily, we don’t have to worry about that much in Indiana, but tree roots and old piping are still fairly common issues. A small camera attached to a long cord is inserted into the homes piping through the clean-out and is pushed as far as possible up to 100 ft. (or the length of the cord). The inspector can see the condition of the pipes in real time, but also reviews the video afterwards to make sure nothing was missed. Sewer camera inspections are fast, simple, and non-invasive, and are certainly worth your time as a home buyer. 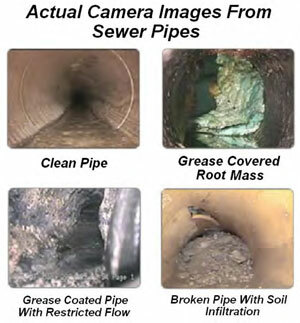 You can view a video of one of our inspectors performing a sewer cam inspection here. Our sewer inspections are fast and thorough, and will give you peace of mind before moving your family into an older home. Purchasing a sewer cam inspection now may seem expensive, but compared to the cost of replacing a failing sewer line, it’s an inspection you can’t afford to skip. The cost to repair a main sewer line is an average of $2,444. Ordering a sewer cam inspection prior to closing can save you thousands of dollars in repair and damage fees, as well as the hassle and stress that accompanies a failing sewer line.